How Cristian Tambley keeps the PLL Base Camp running. 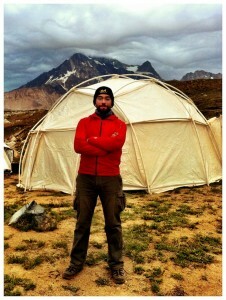 Cristian has been providing logistical support to scientific the expedition in Chile for many years now, and so when Nathalie began preparations for the Planetary Lake Lander Project, there was no question as to who to call to help organize transportation and all the logistical needs of setting up a scientific base in the wilderness in the Chilean Andes. Cristians company, Campoalto Operaciones. Not only sets up the tents in camp for us, but also Provides Nicolas, our cook, and Andres, our Medic. Since I first met Cristian during the NASA High Lakes Expedition in 2006 I know that I would look forward to working with him in the Andes again, and now we have the opportunity to work together supporting the Planetary Lake Lander.